Tax Return Due Dates and Some History | TaxConnections is a where to find leading tax experts and tax resources worldwide. One of the tax change in P.L. 114-41 is to change due dates of certain returns, starting mostly for the 2016 tax year. The purpose is improved administration of our tax system. For example, one change is to move the due date for a calendar year corporation return from March 15 to April 15 and that of a partnership from April 15 to March 15. That is smart because the partnership return is needed to get information to the partners. No one needs the information on the corporate return in order to file their return. The AICPA has a helpful chart that lists the changed due dates. There is no change to the due date of Form 1040 – it remains April 15 with the extended due date still being October 15. Which brings me to my main point – some trivia. Did you know that individual returns were once due on March 15? 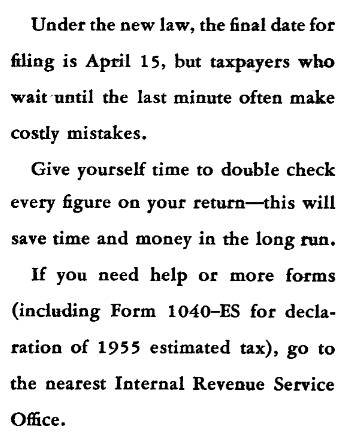 I also find this statement from the instructions interesting – that you should have no problem filing your return and if you need help, the IRS will sell you a guide book for 25 cents! Tax rates were a lot higher in 1954 and 1953 – in the low 90% range. Of course, most people did not have income high enough to be in the rate. For 1993, you’d have to have income over $300,000 to have the excess taxed at 92%. That equals about $2.7 million today. That is no doubt, a high rate. There were 26 tax brackets ranging from 22% to 92%. You’d be at the 41% bracket with income over $12,000 ($107,000 today). 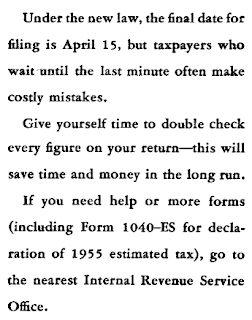 There was a tax table – you can find it on page 12 of the 1953 instructions. Tax rates are still high today, but certainly not at 92%. The highest individual rate is 39.6% and less than 2% of individuals have to deal with that. One of several reasons for high rates today is that they support our small tax base – made small by the numerous deductions and exclusions allowed in our complex income tax system. Hope you enjoyed looking at the old returns. What do you think – about the due dates, old returns, rates?